“The Scoop!” is finally here! First introduced in Dan Harlan’s Pack Small, Play Big Kids Show, many performers wondered if it would ever be available as a manufactured item. After many years of R&D, Harlan has finally found the right combination of High-Quality Materials to make a Professional Prop you will be proud to add to your show. Each one is a hand-crafted work of art! The “Secret Special Something” is Precision-Machined from Stainless Steel with Artist-Applied Pigments and Hand-Detailed Frost-Finish to look like the real thing… from any distance. 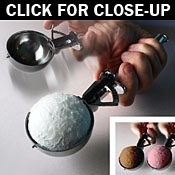 The device is carefully Custom-Fit to a beautiful, Heavy-Duty Trigger-Style Ice-Cream Scoop with a Stainless Steel Handle (it even has a steel loop for convenient hanging!). This thing is Solid… and Built To Last! Just don’t leave it in the kitchen – it looks so innocent someone would mistake it for an ordinary server. Way beyond ordinary, “The Scoop!” is a High-Quality Professional Magic Prop. I’m sorry, I got so carried away with the beauty of this thing, I forgot to tell you what it does. Basically, Anytime you want you can show “The Scoop!” Empty, use it to scoop a Full-Scoop of Ice-Cream from Anywhere you want, then Deposit the scoop of Ice-Cream into Any Other Thing you want, whereupon said Ice-Cream Vanishes! I always wanted to say “whereupon,” but seriously, think of the possibilities! You can use “The Scoop!” with your Milk Pitcher to Vanish a Milkshake… or Change it into Milky Ways Candybars like Harlan does! You can scoop Ice-Cream into your spectator’s Pocket, Hat, Backpack… or whatever! You can even Change a scoop of Ice-Cream into a Folded, Signed Playing Card in your spectator’s hands, if you want! If you have your own TV Special, you can visibly Change one Flavor of Ice-Cream into a Different Flavor… just ask Harlan first (he’ll consult for you)! “The Scoop!” makes a Milk Pitcher cool… or “The Scoop!” can be used by itself to replace the Milk Pitcher. No matter how you decide to use “The Scoop!” we know you’ll find a flavor you like! Comes standard in your choice of Vanilla, Chocolate, or Strawberry (Custom requests? Contact us).